Weed wiping may offer a way to reduce black-grass seed returns by applying herbicide to the weed ahead of the following crop. Weed wiper solution to #blackgrass? Mark Spicer, managing director of Norman and Spicer Agriculture, Hutchinsons Group, has been looking for alternative methods to control weeds including black-grass, rye-grass and wild oats. Mr Spicer said: “I knew that American farmers were practising weed wiping which is exactly what the name implies, wiping weeds with herbicide from a boom on the back of a sprayer. A weed wiper is a kit attached to the back of the boom made up of a row of sponges that are gravity fed with herbicide. 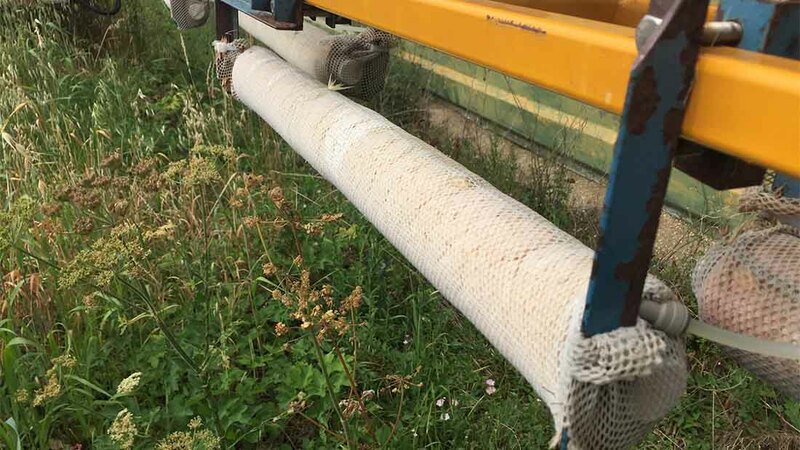 “A farmer in Bedfordshire had a weep wiper retrofitted to his conventional sprayer to apply glyphosate at a concentrated rate to destroy wild oat and black-grass seeds ahead of the next crop, and there is no doubt that we have been able to kill off a large amount of the black-grass and prevent a huge seed bank being returned to the soil,” said Mr Spicer. “We need to do some further work to quantify this, but the reduction is significant enough to warrant spending more time on the concept. The weed wiping approach is in its second year of trials. As well as cereals, it may also have potential for use in weed control in sugar beet and brassica crops, according to Mr Spicer.